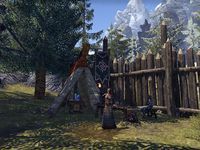 This Mages Guild is a tent housing a Mages Guild branch in Jorunn's Stand. This Mages Guild branch is not marked on the in-game map. This page was last modified on 19 November 2018, at 06:21.